If you want to look something up using your Apple Watch, there are fewer more annoying answers than being told to open up an iPhone app. That's not what you paid £300-odd or more for, right? It's pretty common, though. We're a way off watches replacing our phones. And, know you what, we're ok with that. However, we're going to look at the things Siri iscapable of. Get ready to talk to your wrist in public, because you're soon going to look like a crazy person. No points for guessing which method is the most reliable. 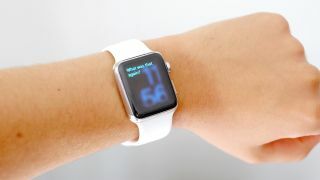 You'll feel a small pulse on your wrist from the Haptic Feedback engine when Siri is ready and waiting. Siri is actually capable of the equivalent of a Google Image Search (Spoiler: it actually uses Bing) — right from the Apple Watch. Just say "Find pictures of X" and the results will show up right on the screen. Unfortunately, you can't save images or zoom into them, but it's a neat way to look up images of that famous person you just clocked walking out of Primark. If you're honestly too lazy to open up the Music app and change the volume, pause or flick to the next track. You can get Siri to do the job for you. Just say 'next track', 'pause music' and so on, and Siri will get the gist. Much more interesting, you can also pick a specific artist by saying "play..." and their name. Siri's pretty good at getting the band names right. This will work for any music stored on your iPhone. Siri hooks up to a limited number of online resources through which the Apple Watch can search, without having to resort to looking at the browser. It's these little tidbits of information that make perfect use of the Apple Watch's small screen. The two repositories for information that Apple use are Wolfram Alpha and Wikipedia. There are a few bits of information you can reliably get, most of the time. This includes calories in foods and the dates of birth of famous people. Eggs are 55 calories a piece, apparently. On the people side, if Siri misinterprets the name of a famous person, it's game over: you'll be sent straight to the iPhone's browser. But it's fun to play with for 2.5 minutes. Wolfram Alpha is also handy for looking up the dates of public holidays and the various religious bashes. Simple and obvious, but useful, you can set a reminder, alarm or timer using your Apple Watch. This can be a two-minute timer for boiling an egg, one to wake up you up in the morning or a reminder to pick up the parents from the train station that evening. It's reminders that are the most interesting, though, as you can attach them to a location. So you might want a reminder of something when you get home, or get into work. It doesn't end there, either. How about a reminder-location-timer mash-up? You can set a two-hour timer that kicks off the minute you get home, if you like.